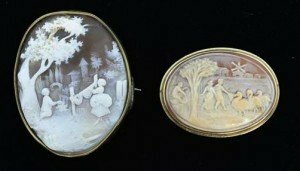 A 9 carat gold mounted shell cameo pin brooch, together with another ivory inlaid 9 carat gold edged brooch. A 9ct gold garnet and pearl flower brooch; a Pinchbeck and turquoise pendant brooch diamond chip cluster bar brooch. 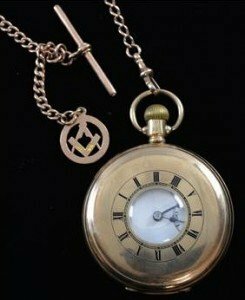 9ct Gold half hunter pocket watch the white enamel dial with subsidiary seconds dial and a 9ct rose gold watch chain with Masonic fob. 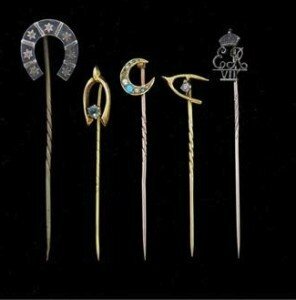 Victorian gold stick pins, wishbone set with small diamond, another with pearl and turquoise crescent moon, two others and a silver horse shoe pin. 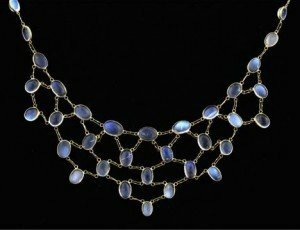 Moonstone and gold fringe necklace, set with oval cabochon-cut moonstones in a rub-over setting. Mounted in yellow metal. Three gold gem set rings, a garnet in closed back setting, two edwardian ruby and diamond and a red paste ring. 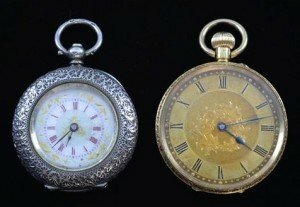 Two lady’s pocket watches, one 18 ct gold with engraved back and floral engraving to face and similar in silver with enamel dial. 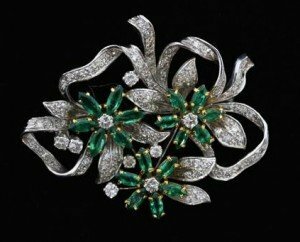 Emerald and diamond garland brooch, set with marquise cut emeralds and brilliant cut diamonds, in platinum and 18 ct gold. 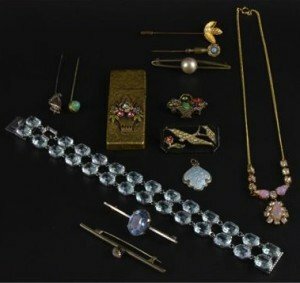 Costume and hardstone jewellery, including Edwardian paste set brooch and earrings, hardstone necklace and turquoise set brooch. 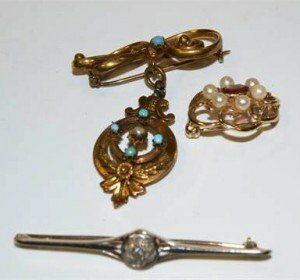 Group of vintage costume jewellery, bar brooches, a bracelet, enamelled silver pendant, and a paste set miniature manicure set. Heart form pendant with locket back, two silver bangles set with turquoise, other turquoise and blue stone jewellery. 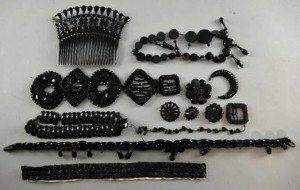 Large quantity of Victorian jet, including a hair comb, jet chains, fabric trims, other items of jet jewellery and numerous beads. 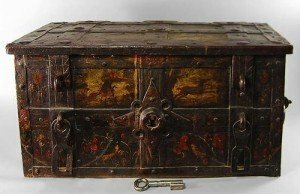 A iron bound rectangular Armada chest, 17th century, with two carrying handles and padlock hasps, with painted panels depicting hunting and flora, with associated key. 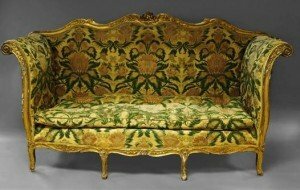 A French gilt framed sofa, circa 1880, with carved foliate decoration to the channel moulded swept frame and upon shaped legs. 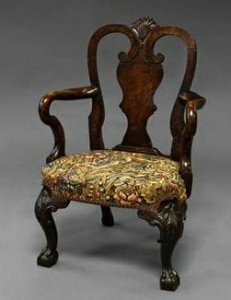 A George II style mahogany child’s arm chair, 19th century, with shell carved top rail, scrolling arms, tapestry upholstery, on leaf carved cabriole legs, claw and ball feet. 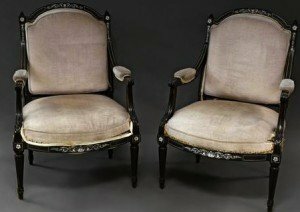 A Louis XV style salon suite, circa 1900 comprising a two seat canape, a pair of fauteuils and two side chairs with Aubusson tapestry upholstery and on cabriole legs. 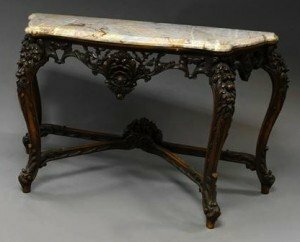 A French Louis XV style carved walnut and marble topped side table, late 19th century, with pierced and shell carved foliate apron, conforming stretchers. 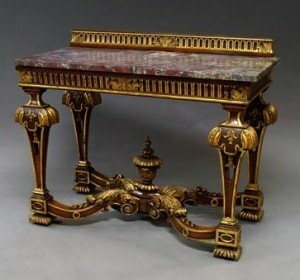 A French Louis XVI style gilt wood and marble topped side table, late 19th century, with fluted and foliate frieze, above square tapering legs, joined by foliate stretcher. 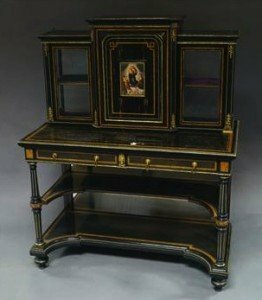 A Victorian ebonised, coromandel, amboyna inlaid and gilt brass mounted bonheur du jour, with central cabinet having door mounted with Berlin style porcelain plaque, flanked by two glazed cabinets above base with two frieze drawer raised upon two shaped tiers flanked by fluted front legs, overall inlaid with amboyna and mounted with gilt brass decoration. 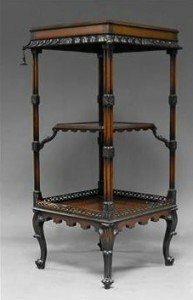 A 20th century mahogany chinoiserie three-tiered etagere in the Georgian style, the square top with carved pagoda roof detail over two further tiers, the base with pierced gallery, supported by cluster corner columns and raised upon cabriole legs with scroll feet.